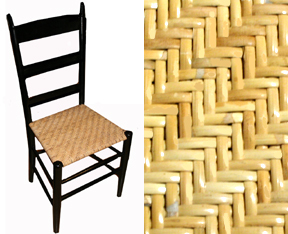 20-page fully-illustrated how-to's for Herringbone Seat Weaving. Suitable for all Binder Cane widths, and Flat Oval reed in 3/16" or 1/4" width. Uses one hank, coil or pound for one seat. Also called "twill weave" in some parts of the U.S.
20-page Herringbone Seat Weaving Booklet, fully-illustrated how-to's. Suitable for all Binder Cane widths, and Flat Oval reed in 3/16" or 1/4" width. Uses one hank, coil or pound for one seat. Also called "twill weave" in some parts of the US.